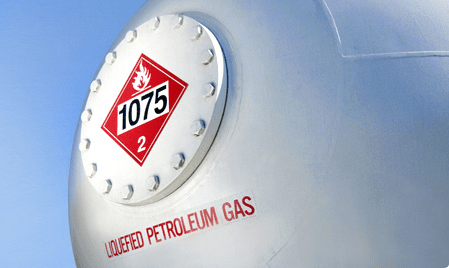 Propane, also known as liquefied petroleum gas (LP gas) is a highly flammable gas. It smells like rotten eggs, a skunk's spray, or a dead animal. Some people may have difficulty smelling propane due to their age (older people have a less sensitive sense of smell); medical condition; or the effects of medication, alcohol, tobacco, or drugs. Consider purchasing a propane gas detector as an additional measure of security. For your safety, please read and share the following tips with people in your home and other propane locations. Print and keep copies in a convenient place. Immediately put out all smoking materials and other open flames. Do not operate lights, appliances, telephones, or cell phones, Flames or sparks from these sources can trigger an explosion or fire. until your propane retailer determines it is safe to do so. Before you attempt to use any of your propane appliances, your propane retailer or a qualified service technician must check your entire system to ensure it is leak-free. Propane smells like rotten eggs, a skunk's spray, or a dead animal. Some people may have difficulty smelling propane due to their age (older people have a less sensitive sense of smell); medical condition; or the effects of medication, alcohol, tobacco, or drugs. Under some circumstance, you may not smell a propane leak. Propane gas detectors sound an alarm if they sense propane in the air. They can provide an additional measure of security. You should consider the purchase of one or more detectors for your home. • Buy only units that are listed by Underwriters Laboratories (UL). • Follow the manufacturer's instructions regarding installation arid maintenance. • Never ignore the smell of propane, even if no detector is sounding an alarm.